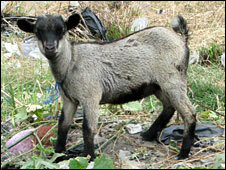 Many Nigerians believe that magicians can change shape into goats. The goat was brought to police by, as BBC’s Andrew Walker states, an ill-educated vigilantly squad who are only trying their best to fill the gaps left by the police. Recent statistics show that over 30% of Nigeria’s population cannot read and combined with high crime rates and a strong belief in witchcraft seems that this kind of case is only too common.